SEATTLE, WA, Feb. 1, 2010 -- Fantagraphics Books and noted historian and critic Rick Marschall have announced the establishment of a new line of books, Marschall Books, an imprint devoted to comics, cartoons, and graphic humor. "Marschall Books will offer a unique and wide range of comics and cartooning projects," said Fantagraphics Books publisher Gary Groth. "The breadth and depth of Rick's historical vision is such that he will be editing anthologies of complete strips, 'Best Of' collections, critical appreciations, biographies, and some new multi-media projects." Rick Marschall is the author or editor of more than 62 books and hundreds of magazine articles, mostly in the area of popular culture and many on comics history. A former editorial cartoonist, he has served as comics editor at three newspaper syndicates. Marschall was also an editor at Marvel Comics (founder of Epic Magazine) and a writer for Disney comics. Recipient of many awards for his projects including the Eisner, Harvey, and Friend of Fandom awards in the US; the RTL award in France; the Max und Moritz Prize in Germany; and the Torre Giunigi and Yellow Kid awards in Italy, Marschall has been the American representative of the Lucca, ExpoCartoon (Rome) and Angouleme comics festivals, and has worked for several European graphic novel publishers, including as Vice President of Dargaud USA. He was consultant to the US Postal Service for the 20-stamp set of commemoratives marking the comic strip's centennial and has taught various popular culture and comics classes at the School of Visual Arts, Rutgers University, the Philadelphia College of Art (now University of the Arts), and the Summer Institute for the Gifted at Bryn Mawr University. "I am happy to be associated again with Fantagraphics Books," Marschall said. "Together we made history about comics history with the magazine nemo: the classic comics library, which ran for 30 issues. Many other projects we did together -- among them the original Complete E C Segar Popeye; Caniff's Dickie Dare; Will Gould's Red Barry; Winsor McCay's Daydreams and Nightmares -- pioneered the reprints-and-anthology genre." Marschall was also the editor of packager of The Complete Color Little Nemo in Slumberland (which ultimately was packaged for 11 publishers around the world, including Fantagraphics Books), The Komplete Kolor Krazy Kat, and color reprints of Polly and Her Pals and Terry and the Pirates. Said Mr Groth: "Our association with Rick began in 1981 when he began editing the now legendary and ground-breaking magazine nemo, the most breathtaking magazine about newspaper strips and cartoon illustrations ever published, and our first Popeye series shortly thereafter. We're thrilled that he'll be editing books on a regular basis." The Marschall Books imprint will draw upon the extensive and famed collection of Rick Marschall, arguably the nation's largest private collection of comics and cartoon archives. It is a collection comprised of thousands of original drawings; complete runs of newspaper comics beginning in 1893; complete runs of the major cartoon and humor magazines from American and Europe; comic books and reprint comics, graphic novels, political cartoons and protest graphics, specialty collections including posters, ads, toys and games, post cards and greeting cards, pinbacks; cartoonist letters and sketches; biographies and anthologies. "The major commitment to a publishing program that will re-introduce much of this material to the public will commence in the Fall of 2010 and continue in every Fantagraphics Books publishing season, as many as 4-5 projects a year," said Groth. "Marschall Books will vary in size and format, always appropriate to the subject matter, and with an uncompromising dedication to quality." In addition to the first two releases described below, and the subsequent releases in production for the next two years, Marschall Books also plans several series: Cartoon Masters, monographs on major artists; and Cartoon Masterworks, anthologies based on themes, eras, and topics. Also projected is a definitive three-volume history by Rick Marschall, Comics: The American Art. While critics debate whether comics are high art, or is low artâ€¦ the truth has been, is, and will be, that the comic strip was born as a commercial medium and was nurtured by competition, commerce, and advertising. 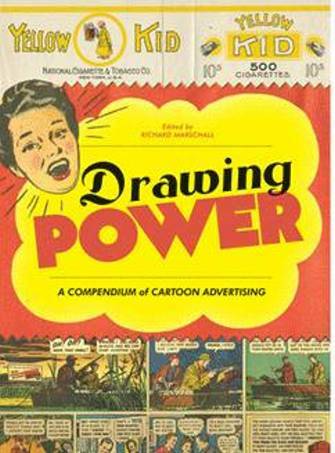 Drawing Power will be the first book-length examination (and celebration) of the nexus of commerce and cartoons. 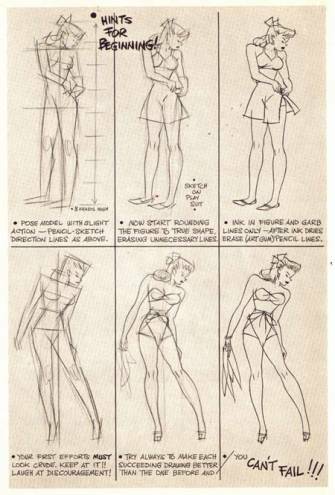 It will focus on the commercial roots of strips; the cross-promotions of artists, their characters, and retail products; and of the superb artwork that cartoonists invested in their lucrative freelance work in advertising. The book will examine cartoonists as celebrities, and their advertising efforts from the first heartbeat of the comic strip as an art form. Here are surprising and familiar examples of products and memorable ad campaignsâ€¦ histories of the major ad agencies... catch-wordsâ€¦ popular examples. Cartoon ads through the years will include Yellow Kid advertising; Buster Brown Shoe campaigns; Dr Seuss' "Flit" cartoons; WWII ads; Pepsi and Pete by Rube Goldberg; Peanuts shilling Falcons and BC shilling Mountain Dew; Duke Handy selling cigarettes; Dagwood selling atomic energy; and virtually every superhero trafficking in the mortal realm to shill every product imaginable. A special section will showcase ads that featured cartoonists themselves as hucksters; can you believe Walt (Pogo) Kelly selling cement? Includes bibliography and publication-sources. By Rick Marschall with Warren Bernard. Before he created Raggedy Ann, the great Johnny Gruelle drew Mr Twee Deedle, an astonishing graphic and fantasy Sunday page. He secured the job with the New York Herald by winning an open competition for a strip to succeed Little Nemo in Slumberland! Twee Deedle was a worthy successor to McCay's masterpiece. 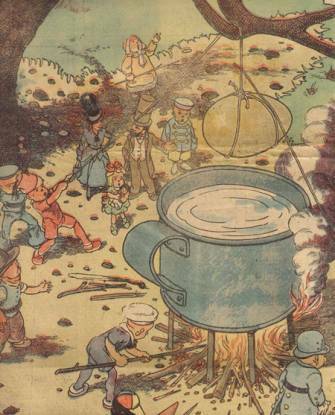 This Sunday color page (1911-1914) by Johnny Gruelle is unjustly forgotten by history: charming fantasy; a wonderful child's world (the title character was a sprite who appeared to the strip's two human children, Dickie and Dolly); moral lessons, light whimsy, bizarre surrealism; stunning artwork and composition; and impressive color work that made every full Twee Deedle page look like a painting. This oversize collection will reprint the best of Gruelle's pages; information and artwork from the competition that won his place as Little Nemo's successor; background information on Johnny Gruelle, including his earlier work (when he worked at George Herriman's side) and later work (â€¦ a doll named Raggedy Ann); and much more. // John Barton Gruelle (1880-1938) drew for newspapers in Indianapolis and Cleveland before joining the pre-print syndicate World Color Printing Co of St Louis. He won a nationwide talent contest to draw a Sunday page for the New York Herald, intended to succeed Little Nemo in its pages. 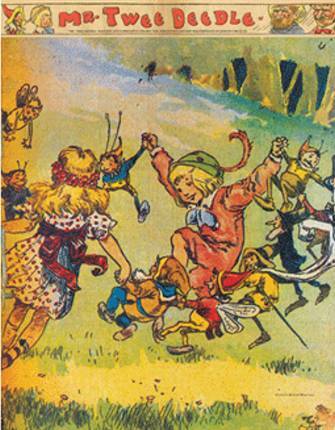 Mr Twee Deedle ran between 1911 and 1914 and generated two color reprint books. Subsequent to this strip, Gruelle created Raggedy Ann, whose tales and fellow characters became staples of American children's literature. 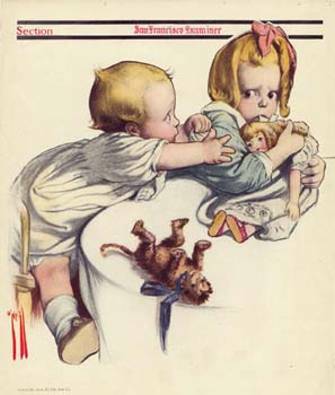 Gruelle wrote and drew many other books; full-page cartoons for Life and Judge (subjects of a future Marschall Books anthology); and another Sunday page, Brutus, for newspapers. The book will feature an introduction by the cartoonist Tony Millionaire (Maakies). The music and movement of Krazy Kat are as characteristic as the brick and changing landscapes, and this important book will complete the circle for Kat fanciers. This book-and-disk set will deal with the multi-media lives of the kat who walks, and dances, among us. 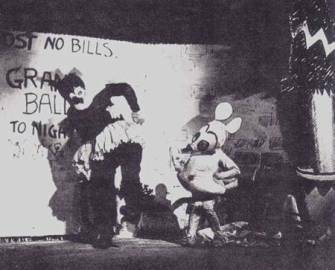 An unprecedented treatment of the legendary Krazy Kat jazz ballet and rare animated cartoons. 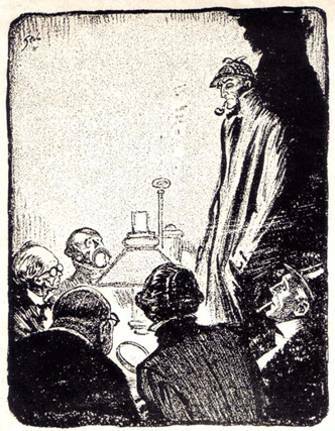 Fans of Sir Arthur Conan Doyle's immortal creations will rejoice at this overflowing art book featuring faithful reproductions of original book illustrations, unpublished artwork from Doyle's era, theatrical and movie posters, and complete runs of Sherlock Holmes comic strip and comic book versions, and parodies. This glorious history-and-compilation is long overdue -- filling a hole in the tracking America's cartoon and comics heritage. Mail-Order Geniuses is a survey of the legendary correspondence courses of the Landon School, the Federal School, W L Evans, ZIM, Clare Briggs, Billy DeBeck, Russell Patterson, Jefferson Machamer, Charles Kuhn, Bill Nolan, Joe Musial, Famous Artists, etc. Rose O'Neill shattered glass ceilings her entire career. She was the first major female cartoonist, more than a century ago. She achieved her greatest fame as creator of the inimitable Kewpie dolls. This mature treatment of Rose O'Neill's life and place in cultural history will be accompanied in this oversized color book with hundreds of her compelling wet-brush cartoons and full-color art, along with photos of Rose and her sculptures. The dozens of Teenie Weenies characters were stars of a little-mentioned but fondly recalled and long-running classic of newspaper cartoons and children's books. William Donahey was a Chicago Tribune cartoonist who created the next generation of Brownies in 1914, and the diminutive cast sought adventures and withstood trials through glades and dells into 1970. This breathtaking collection features biography, photographs, the characters' merchandising history -- and, for the first time, a major portion of full-size reproductions of the Teenie Weenies' adventures. Other Marschall Books in planning stages include a book-and-disk series that traces the history of animated cartoons through the various studios; Santa Claus in Cartoons; Uncle Sam in Cartoons; an annotated anthology of Pulitzer Prize winning cartoons; an anthology of artwork and prose from Dutch Treat Club annuals; an anthology of radical cartoons; annotated cartoon histories of World Wars I and II; a treasury of comic pages from Boy's Life; biographies and anthologies of Heinrich Kley, F Opper, A B Frost, Gluyas Williams, Ralph Barton, Bill Holman, Dr Seuss, and Virgil (VIP) Partch. It should be noted that many of the projects in the Marschall Books line are being produced with the cooperation of cartoonists and artists' estates, as well as museums and institutions. Says Marschall, "My own archives and image bank notwithstanding, I want to assure readers of my commitment to secure the best visual material, and to uncover the fullest historical accounts I can. A lifetime of research and associations will enable Marschall Books to produce definitive treatments of every artist and title we will publish."